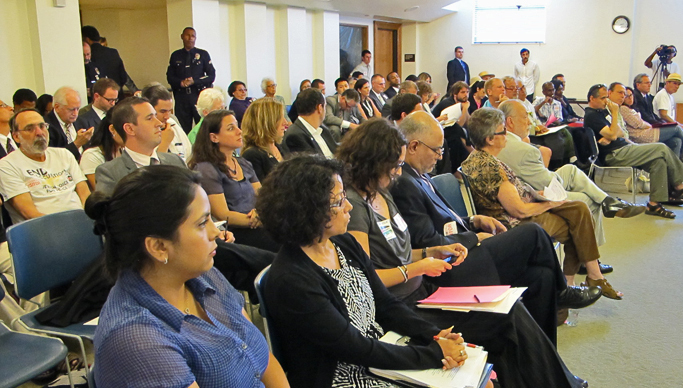 On September 12, 2012, Los Angeles Residents Confronted Veolia Corporation on Human Rights Violations at L.A. City Council Transportation Committee. Below you'll find a Report-Back and Call to Action from DumpVeolia.LA. ***PLEASE TAKE ACTION TODAY! *** There's something everyone can do among the items in red below. On Wednesday, September 12, 2012, more than 40 people gathered to support the LA DumpVeolia Campaign at 2pm in the middle of a workday at the City of Los Angeles Transportation Committee during the first public hearing regarding the renewal of two contracts with Veolia to operate several lines of the city-run DASH buses that provide short run bus service to city residents. Over 30 people directly addressed the committee explaining their personal reasons for opposing the city doing business with a corporation actively involved in maintaining, and profiting from an apartheid transportation system in Palestine. Over 500 postcards, petition signatures and letters from groups and individuals opposed to the awarding of this contract were submitted to the committee. committee of the L.A. City Council in opposition to Veolia. Those making statements included representatives of Jewish Voice for Peace and the Los Angeles County Green Party. Speakers included Christian clergy members, Anti-war organizers, Immigration-Rights organizers, Human Rights lawyers, and Labor Organizers. Speaking against Veolia were members of the African-American, Chicano/Mexican, Jewish and Muslim communities in Los Angeles, as well as both Christian and Muslim Palestinians. One representative of Veolia Corporation and four representatives of the Jewish Federation of Los Angeles spoke on the other side arguing that Veolia’s record of violating basic Human Rights around the world should not be considered when deciding on the awarding of this contract. Despite Los Angeles’ history of being one of the first major cities in the U.S. to boycott and divest from the South African apartheid regime in the 80’s, divestment from corporations doing business with the military dictatorship in Burma in the 90’s, the severing of ties with the Boy Scouts of America in recent years because of that organizations open discrimination against members of the Lesbian/Gay/Bi/Trans/Queer community and Atheists, and the Boycott of Arizona beginning in 2010 after that state passed its racist anti-immigrant law SB1070 and despite the overwhelming support in the room to not award this contract to Veolia the three members of the committee present: Paul Koretz, Tom La Bonge and José Huizar voted unanimously to support Veolia’s bid. support for the DumpVeolia.LA Campaign. The LA DumpVeolia Campaign now has reason to believe that these contracts will now come before the full Los Angeles City Council on Wednesday, September 19th for a final decision. We strongly urge all who can to attend and be prepared the make a brief statement. There will be no comment time for this specific issue; however, there will be a period for general comments and we need you there! Please RSVP now to attend the hearing this Wednesday, September 19th! Stay tuned as the time approaches, as plans are not final. If you are in the L.A. area but cannot attend on Wednesday, please click here to send letters to the L.A. city council. And even if you are not in the L.A. area, everyone can sign this petition to the council members asking them to Dump Veolia! Sign today! 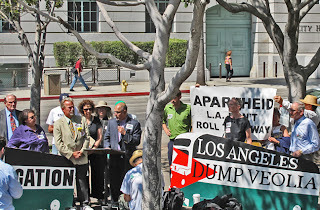 The LA DumpVeolia Campaign would like to express their deepest thanks to all those who were able to attend this important meeting that put issues of Palestinian human rights and Israeli Apartheid directly in front of Council members and the City of L.A. in a way that hasn’t happened for at least many years, if ever. We believe we made a very strong statement that we will be able to build on next week at the full City Council meeting and beyond, whatever happens there. We also want to thank everyone nationally and internationally who have provided such invaluable support and solidarity. The Los Angeles Dump Veolia Campaign is a local autonomous group that is part of the international Palestinian-led Boycott/Divestment/Sanctions (BDS) movement working for justice and respect for human rights in Palestine. Please watch for important action alerts in the next few days for ways you can support the Campaign as we get closer to the final City Council vote. Click here to view the Los Angeles Times article about the action. Contact DumpVeolia.LA at dumpveolia.la@gmail.com to receive action alerts and to get more involved in this critical stage of the campaign.